I wonder how many of you manage your children in the same way no matter where you are? Do you let your children get away with just that little bit more when you aren’t at home? Or the opposite? I know we don’t always offer the same discipline/consequences. As much as we would really like to, we don’t. I’m pretty sure I’m not alone in this either? I know that consistency is key to helping Mini, but I am we’re struggling. Mini’s behaviour is improving, or at least, the way we’re dealing with it is improving. We’re more consistent and we follow through on what we say. We’re becoming more confident in taking him out again – baby steps at the moment, but out for walks, to the supermarket, we’ve ventured to friends recently, and Mini had a much wanted sleepover at Nanna and Grandad’s.. But I know that without timeout, happy faces and our other strategies, we don’t handle him as well out as we do at home. At home if Mini screams, he goes straight onto time out. If Mini screams when we’re at the shops, what do we do? There is no time out. I know some mums create a time out wherever they are, but I’m just not brave enough to do that, and because of the way we ‘do’ timeout, I can’t just drop everything and bear hug/hold/cuddle a crying child in the middle of the highstreet, especially if I also have Dollop with me too. So if I’m on my own, he gets away with it. I have no choice - I have to shop – we have to eat, have clothes etc (although I admit I do try to do things like this in the evenings, so it’s not so much of an issue now I’ve changed my own routines) If the NC is with us, he’ll often take Mini outside, or back to the car, to remove him from the situation. When visiting family or friends, things are different again. I have, in the past, used time out at my in-laws house – only once, because it was awful. Nanna and Grandad got to see Mini at his worst (well, it wasn’t that bad, but probably the worst they’d seen at that time). I felt awful they had to see it. They didn’t like seeing Mini so upset. I wasn’t confident at using time out then because a) we’d not been doing it long and I wasn’t sure how well it was working and b) because I was worried that my in-laws would judge me for using a technique that they wouldn’t have. Nanna’s very good at talking to and reasoning with Mini, but it doesn’t work for me or the NC, hence us using other techniques. There’s that fear of being undermined too, At times I’ve asked Mini to stop doing something at a friend’s house and he’ll ignore me, so I’ll ask him again. Then friend will sweep in and say ‘oh it’s alright, I don’t mind if he draws in green felt tip pen all over my new hardwood floors’ and he’ll stop straight away. Mini then has that smug look on his face, we feel pathetically useless and friend doesn’t realise that he/she has just undermined us. Now there’s a bit of a debate…is it best to stop (as we’ve previously done for our own sanity) all contact with the outside world so these opportunities just don’t present themselves? Mini doesn’t get stressed, we don’t get stressed. Do we make a concerted effort to go out regardless of the possible behaviours that might occur? And if this is the way forward, how do we cope on those days where Mini is less….willing to co-operate comfortable in the situation? I kind of think the overall decision about going out or not can only really be made when we find out why these situations bother Mini. We think that part of it relates to his worries about being moved on to a new family (although we don’t know quite why he feels like this). It seems to us that often Mini’s less desirable behaviours occur when he’s in (or after he’s been in) a situation where he feels under threat of this happening. So do we use these opportunities to re-assure both whilst we’re out, and afterwards, that this won’t happen? Or do we avoid those traumatic situations altogether? Only time (and therapy!) will tell…. He does seem to be prone to coughs particularly. And he gets those awful hacking coughs that keep him awake at night, and make his throat sore (although he’ll not often tell me that it’s sore, I’m now attuned to the hoarse voice – a sign of absolute soreness!). I’ve written before about Mini being ill. He’s just not. And even when he is, he won’t tell. I have to use every possible mummy skill in the book to pick up when he’s poorly. He panics over minor ‘injuries’ – such as a bump to the head by a cushion, or if he purposely ‘slips’ off the sofa, but he doesn’t ‘do’ ill. This time, he went from 0-60 in seconds. Friday evening he had a cough, which only started at bedtime. The next day the cough continued a little bit, but we went out, spent lots of time outdoors, and then it all went downhill during the 10minute car journey home. Mini was falling asleep in the car, the NC carried him in. He wanted lots of cuddles (great for helping with attachment issues and worries), dozed off on me, woke up, dozed off. Icecream was offered to help with the throat – I was even offering my newly purchased mummy's only Ben and Jerry’s icecream - but before it had been scooped, Mini was sick. Of course, after that he avoided food. We struggled to get him sipping water. He ASKED to go to bed. He was sick more. Back and forward to bed and bathroom about 4 times. Eek, I’m going to an actual playgroup, you know, where there are other *whispers* ….mums. Dollop turns 2 in 2 weeks, and so far, other than Mini, she has had virtually no interaction with other little people. How on earth have I managed that??? How could I have kept my beautiful baby on her own for 2 years? How have I kept her amused by myself for 2 years? How am I still sane??? Our parent supporter feels it’s important for me to now get out of the house, away from the place where so many challenging and hard things happen. She feels I’d benefit from speaking with other parents and picking up other strategies for dealing with things. And she feels like I’d benefit from timeout and just being me. And there is the obvious aim of getting Dollop mixing and socialising with other toddlers. I agree. I know all of this to be true. I know (and hope) that sometimes lifelong friendships are made at toddler groups and playgroups. Indeed, my mum and her best friend met 30 years ago when I was at toddler group! But I’m nervous. This is because I never felt able to take Mini to a toddler group. I felt that I’d be walking in with a ready made toddler, no birth stories to relay, big sign on my head warning other mums that I was ‘different’, I thought I’d stick out like a sore thumb. 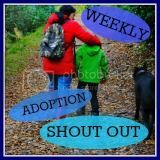 I did manage to go once, to a group recommended by another adopter, but I was so nervous, that I only talked to the other mums I knew to be adopters too, and it was all I talked about. So instead of blending in, I made it blindingly obvious that I was indeed different, and was so embarrassed by my own behaviour, I never went back. Don’t get me wrong, I’m not embarrassed about adoption, I just don’t want people’s pre-conceived ideas about adoption kicking in before they get to know me and Mini. So that was that. To socialise Mini and prepare him for school, he went to nursery instead, which actually was the best choice for him in the end. So now, my fear about not having a birth story is irrational. I do have Dollop’s birth story. But I’m worried about the questions I’ll get about my family. I’m worried all the other mums will already know each other. I’m worried that I’ll have nothing in common with anyone (except for an ability to change a nappy in 60seconds flat!) I’m worried that Dollop with be overexcited and naughty. I’m worried that Dollop will be shy and cling to me the whole time. Yes – I’m a bit mixed up about the whole thing. Getting myself in a tizz about it! Parent supporter is coming with me though…she’s going to do the hard bit – the walking in to a room full of mums – with me. Phew! So keep your fingers crossed for me. I’ll report back when I’ve worked up enough courage to actually go, and not bottle it! So…letterbox. We have a letterbox agreement (sort of) with Mini’s birth parents. When Mini was placed with us, the NC and I signed an informal agreement – a generic document drawn up by social services, in which we filled in the blanks with specifics that we agreed too i.e frequency, whether we are happy for gifts to be sent to Mini, if we want to know about births/marriages/deaths, how letters should be signed i.e Mummy X or just X. Without going into the details, we write twice a year to each birth parent. Letters are sent to a Letterbox co-ordinator who sends them to birth parents, and if they reply it's to the same co-ordinator who sends them onto us. This ensures privacy of each other's addresses and in our case, our surname too. We regularly ask for social services to support Mini’s birth parents in replying. Birth Dad feels it is too hard, and so we’ve never heard from him. However, last year we received a call from Social Services, informing us that Birth Mum had written. We were asked if we wanted the letter sent to us, or kept on file. Of course we jumped at the chance to receive more information about her, and something for Mini to have in the future. Anyway, I was a bit disappointed with her ‘letter’. It was addressed to Mini, even though all our letters are from Stix and the NC, and it wasn’t really a letter. It wasn’t conversational (which is how I try to write to her), it was just a list of acknowledgments – ‘Oh, you like sausage and mash, me too’ and ‘I’m pleased blue is your favourite colour, it’s mine too’. But, it’s communication, and it’s been filed away for the future. Truth be told, the longer Mini is part of our family, the more I resent letterbox. He’s mine, why should I share information about MY son with a virtual stranger? But…I do it because it will help keeps those lines of communication open to Mini in the future. And also deep down, I truly hope she’ll write back, because I’m interested in the life of the person who gave my son life. Recently, I wrote our latest letter. I try to write balanced letters about all aspects of Mini's life. I don’t just give them the good stuff, I tell them about the tough times too, and I’d explained that Mini had a seizure and it was being investigated. I asked if there was any family history we should be aware of. When I emailed it in, I asked (again) for support to be given to Birth Mum, as we really hoped for a reply. Social Services took 6 weeks to inform me that support had been offered but declined. Out of the blue this week, we received a letter from Birth Mum. No warning phonecall this time and despite being grateful for the letter, I’m a bit cross with Social Services for not warning us of it’s imminent arrival. Given that we’re going through some pretty challenging stuff at the moment, I just wasn’t at all prepared for opening the post to find this letter. This letter was much more chatty than before, disclosing a bit more information and sharing some major news. But importantly, Birth Mum had read my letter to her, and had responded to the questions I’d asked her. Yippee, I now have something to tell the neurologist. It might be irrelevant, but it’s something. I’ve been having doubts recently about whether to continue, and I’d shared that with Letterbox, explaining to them about my frustrations. Perhaps the fear that I’ll stop giving her little titbits about her son is what’s driven her to write again, or perhaps she has found the courage and strength to overlook the fact that I’m looking after ‘her’ son. Perhaps she's just not been in the right place to write before. Whatever the reason, I’m so pleased she managed it, as this has given me the reminder that I needed – Letterbox is important. And I WILL carry on. I posted yesterday to write about how well our to-the-minute planning had worked yesterday in overcoming some of the meltdowns that Saturdays usually bring. Saturdays are always difficult, so planning lots of activities, with little time between left Mini no time to get bored, and no time to meltdown. However, in retrospect, it also left little time for his to process emotions, and kept him hyper to an extent as he moved from activity to activity. You know I've talked about those good days...and how those good days are always followed by a bad day?? Guess what! Today, I was so frightened of my own son; I felt that we didn't deserve each other. I don't deserve to feel the way I have today, neither do the NC and Dollop. And neither does Mini, none of this is his fault - he never asked for the trauma in his life, he never asked to be neglected, he never asked to move from birth family, to foster carer, to adoptive family, and he never asked for Dollop to be born (which is the root cause of some of his aggression), but at times he feels so controlling and the choices he makes are his own, although of course they’re fuelled by emotions that he can’t control and doesn’t understand. At dinnertime Mini didn’t want to come to the table, when he did, he wouldn’t stay there, so his dinner was put in the kitchen whilst the rest of us ate, until he was ready. He eventually sat at the table, but when he was asked if he was ready for his dinner he said he didn’t know. When I helped myself to more from the dish in the table, Mini tried to attack me with a fork because he felt it should be his. When the fork was removed, he grabbed daddy’s knife instead…I know I gasped out loud and flinched because this is a new low. I’ll add that Mini still watches CBeebies and Nick Jr. He doesn’t know who Ben 10 is, he doesn’t watch anything that is not age appropriate (except perhaps, gentler episodes of Dr.Who, that are screened by us beforehand). He can’t work the DS yet, and only plays Wii Sports and Wii Music; he’s just not interested, so this behaviour hasn’t come from TV or video games. Tooth brushing brings more problems – Mini wanted help but when it was given he point blank refused to brush his teeth. Then next second he wanted help again, and again when help was given he stopped and clamped his mouth shut. This went on three times, then a consequence was given – if Mini did not want to brush his teeth, then the NC would take Dollop to bed and help when he returned instead, giving Mini time to think about what choice he was going to make. Of course this sparked another meltdown, a big one because Daddy followed through and did something other than pander to Mini’s constantly changing mind. Whilst the NC settled Dollop, I tried to comfort and calm Mini. First with cuddles, but the flailing limbs and well-aimed punches made that impossible. Then words, but he couldn’t hear them over the screaming. So finally, with tickling. This worked, and he didn’t know whether to laugh or cry. I managed to divert his attention by suggesting a quick round of his favourite board game – and ignored the fact that we’re half hour late for bedtime by now. So the game begins, Mini’s doing well, mummy not so well. Then Mini made a mistake and the tiredness and feelings took over. Mini didn’t want to play anymore. He’d had enough of this stupid game. OK I say, I’ll put it away. Big mistake. Mini of course didn’t want me to take it away, he wanted me to fix his mistake, wanted me to let him win, however, he wouldn’t sit down, wouldn’t reset the pieces, and so the consequence was not playing, and I packed it away. Mini clamped himself to my legs as I tried to walk to the shelf where the game lives. Mini clawed at my free leg, scratched my feet. He dropped off, and then punched my bottom as hard as he could. Then he took a run-up and head-butted my legs. Mini then slapped and slapped my legs, and then tried to grab at and pinch my arms. I didn’t dare get a chair out to stand on (as I normally would to reach the shelf) for fear that he would attempt to push me off or pull it out from under me. I flinched every time he raised a hand; he was in a manic state. I managed to pop the game high enough for Mini not to grab at it, and then grabbed him in a bear hug, trying again to sooth him, cuddle him, calm him. He collapsed into me and wailed. Stirred, slapped me a bit, and then collapsed again in a sobbing heap. My son cannot control his frightening feelings, he cannot calm himself, but tonight despite the violence, he collapsed with me and allowed himself to be cuddled, held and soothed. This may not sound like a breakthrough, but actually to me, it is. He let me sooth him. He let me take some of those awful, scary, angry emotions away….I’m hurting inside and out, and I have frightening feelings of my own, but I soothed my son, and he finally went up to bed calm, relaxed and chilled. I won’t mention the tantrum when daddy got him upstairs, but he is asleep. For now, that’s enough.